This week has been officially proclaimed Mid-Summer Loose Ends week, and tying them up is the name of my game. I've had a handful of small, fun projects lazing around in the middle of my To-Do list for weeks now, and I decided it was high time to get 'em done. 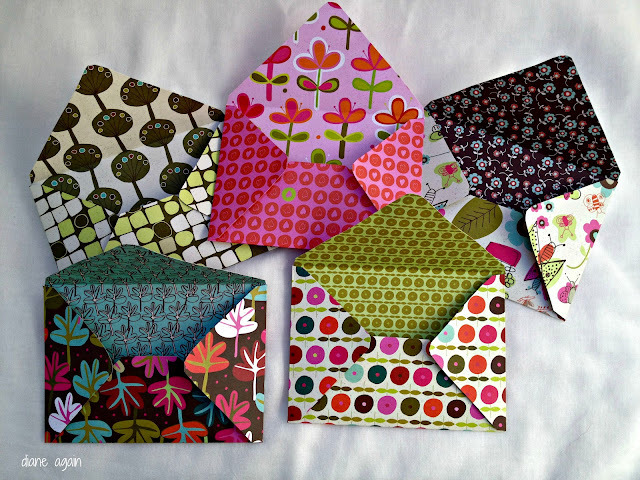 First up: handmade envelopes cut from cutesy patterned paper. 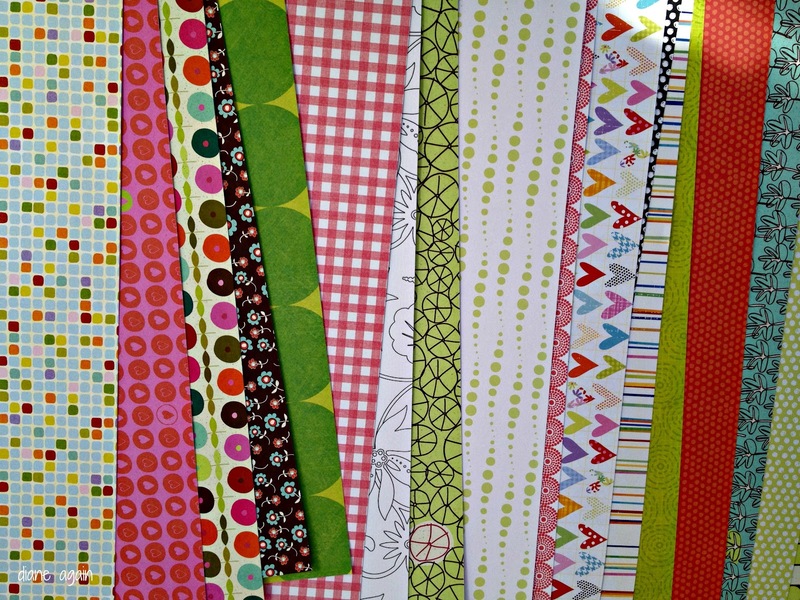 I've been meaning to make a fun little supply of these, for all my patterned envelope needs, for years now. When I ran across this tutorial last month, I decided to just make the darn things already. 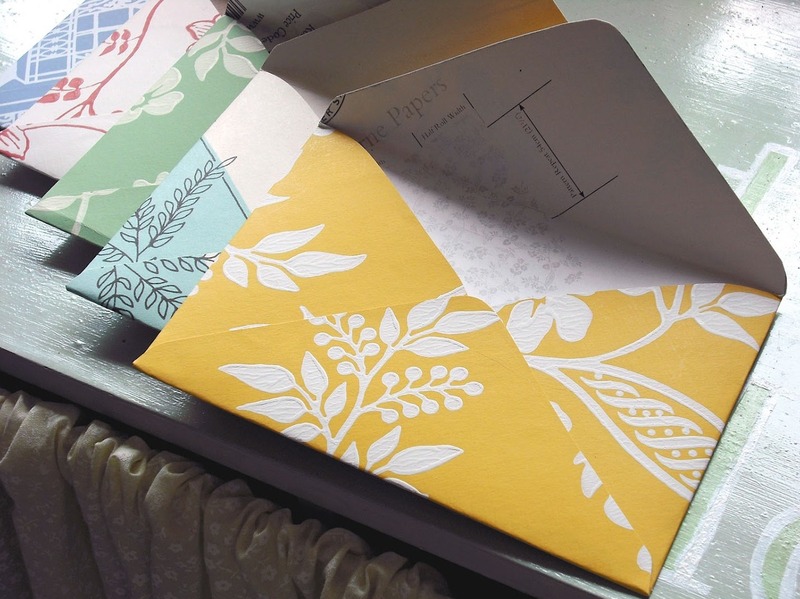 What I really liked about this particular version of handmade envelopes was the adorable pattern on the inside as well as the outside of the envelopes. Love that extra punch of color and design, as well as the surprise factor for the person opening it up. Emily suggested using wallpaper samples, which apparently are double-sided. Sadly, I have none. But I do have a decent stash of double-sided scrapbook paper, so I raided my supply and set to work. Here's the thing about any DIY project - they never work out exactly as you expect. I consider that to be part of the fun. Maybe it's the rebel in my soul, but I like to change things around and make my own rules. 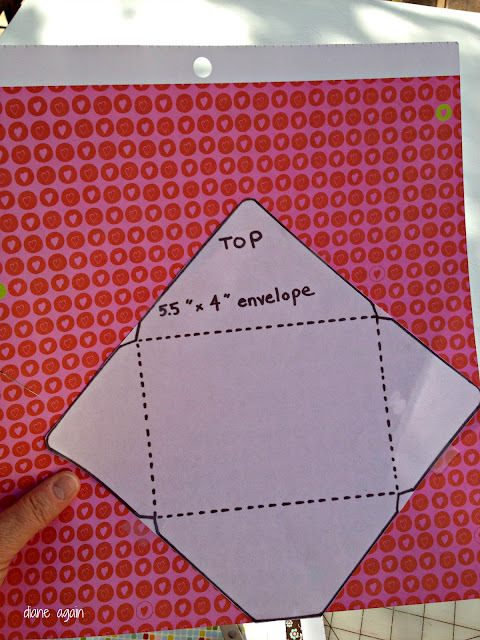 For example, this tutorial suggests you find envelopes around the house, gently rip them open, and use them as a pattern to trace onto your own paper. Well, I didn't like the envelopes on hand around here - I wanted the kind with the classic triangular flaps and all my envelopes just had stubby little rectangular flaps. So I Googled around till I found what I wanted. And tracing the patterns onto the paper with a pen sounded like way too much work, so I taped the pattern to my paper with tiny bits of tape, and happily cut around them. 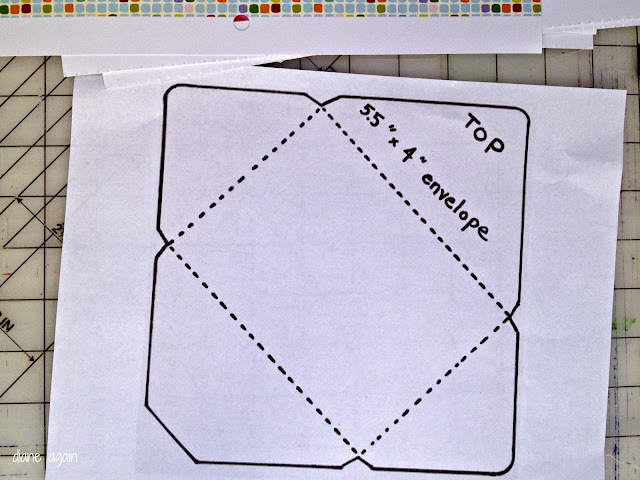 Once I got the first envelope cut out and folded properly, I was absolutely delighted to see how it looked. I was super pleased with the rounded corners, the easy-to-get-right placement of the folds, and of course, the contrasting design hidden inside. 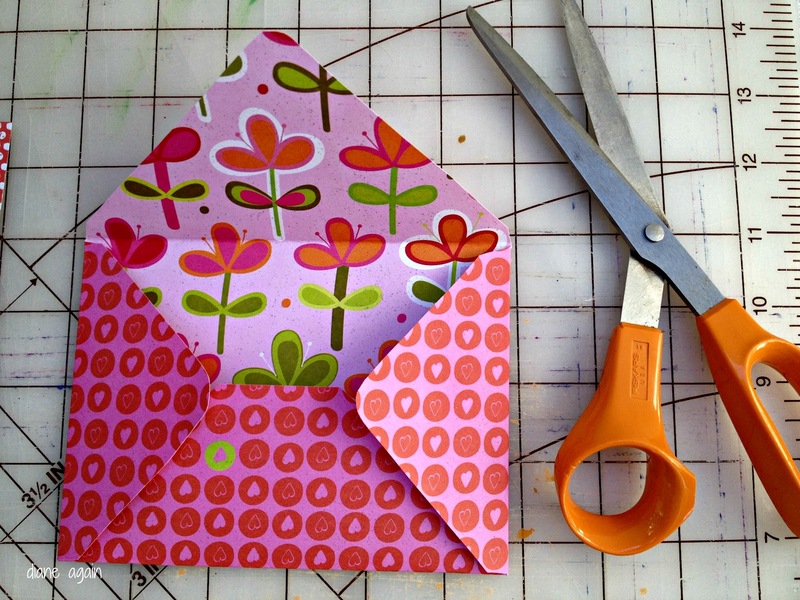 Emily's final step is to use a glue stick to fasten the flaps together to create the little pocket of the envelope. That sounds so innocent and simple, but anyone who's been around a glue stick for more than ten minutes knows it's not. That sticky stuff has a way of going where you don't intend for it to go, and I did not feel like harshing my DIY buzz with a glue stick wrestling match. Also, I was very reluctant to seal up those flaps, thereby drastically reducing the amount of cute inner pattern that showed. Suddenly, my brain asked the question, "Who says we have to glue the flaps down?" Yes, brain, YES. Let's just leave those flaps as they are, alive and free. When it's time to use the envelope, I can put the card or letter inside, fold the flaps in place, and then use a sticker, or a tiny dab of glue, or even a blob of old-fashioned sealing wax to secure them. Then the recipient of the envelope can easily open the envelope all the way and get a full view of the cutesy design inside. That sounds like a win/win to me. So that's what I did. I'm perfectly happy with my surprise twist ending on this project, and I enjoyed the troubleshooting and creative problem-solving as much as any other part of the challenge. Bring on the next project..I'm on a roll! A square shape would be super cute..great idea. I am so thankful to you for inspiring me to finally get on this project! Hi! What was the size of the paper where you printed the template? Regular printer paper. 8 1/2 by 11 inches. The link to the template is not working. Could you share the template? I haven't done this in a long time, thanks for reminding me how pretty these envelopes are!